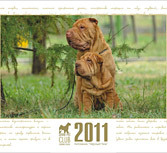 The much-loved Chinese Shar Pei Dogs 2011 Wall Calendar is the ideal gift for any Shar Pei lover this year. The cost with shipping worldwide makes 20 euro. For more information click here. January 16, 2016 Congratulations to all entrants of the National Shar Pei Specialty Show "Golden Sharpei 2016"
We're very grateful to our owners who participated and reached such great results. Congratulations to Vladimir Kozyrev and Chernyi Chizh Onegin with a win in the junior males class and winning the title Junior Club Champion! Alina Sorokina and Chernyi Chizh Octavian with a second place in the junior males class . Tatyana Grishina and Chernyi Chizh Zurbagan the first place in the intermediate, winning the title of Best Male and BEST OF BREED! first news from the Budapest CACIB show, judge Adrian Landarte - BEST JUNIOR -CHERNYI CHIZH GREAT EXPECTATIONS, BEST FEMALE, CACIB CHERNYI CHIZH OH MY DARLING, open class winner R.CACIB CHERNYI CHIZH POLOSA VEZENIA. International dog show Padova 2013. Сhernyi chizh Genuine Risk - JBOB. Big thanks to the judges Richard Hellman and Roberta Semenzato and congratulations to owner Dalila Papi! Welcome to the site of Shar Pei virtual club! Our goal is to create an online encyclopedia dedicated to the Chinese Shar Pei dog breed. Of course, this site is designed not only for breeders and veterinarians - it can be interesting to everyone. share them with others by starting a blog. In future we plan to open access to this forum to all Shar Pei lovers. On our site you can find thousands of Shar Pei photos taken on a show ring and in everyday life. an old hand at taking pictures of Shar Pei and dogs of other breeds. Our kennel has been engaged in breeding Shar Pei since 1994, and we still discover new facets of this breed. increases; they are less suffering from allergy; dog care minimizes. realize Shar Pei first you must take some unique features of these wonderful dogs into account. temper. Every Shar Pei is a vivid personality, and each has its own temper. What we want to do is dispel some myths and delusions surrounding Shar Pei and create a real and true image of the breed.